The solution to the previous round can be seen here (credit anarine). Shiki enjoys sewing and putting together outfits. However, she is trying to get into Quilting. Problem is.. she is gonna need some extra help. Maybe if you give her a hand, she will give you some cards? Quilting is an logic-based, color-placement puzzle based off of the popular Sudoku using colors instead of numbers! The rules are simple: each 3x3 box, row, and column contains one of each color. 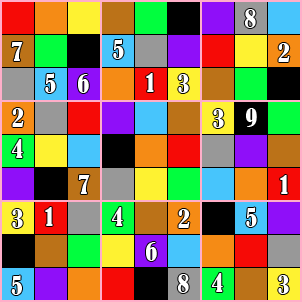 Additionally, although you are filling in colors, each color can also be associated with a number. This round will close on Thursday, Feburary 7th.